Headquartered in Sabah, this bus operator has been in business since 2008. 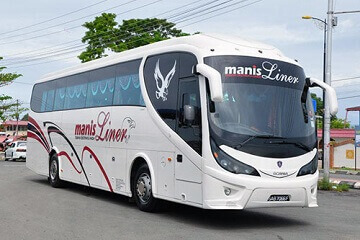 Manis Liner is a bus operator which specialises in trip from Kota Kinabalu to Semporna, which happens to be the gateway to many island getaway such as Sipadan island, Mabul island and more. Their fully air conditioned buses consist of 42 and 44 seaters single decks, with comfortable seats. Aside from that, their buses are also equipped with charging port to charge electronic devices as well as televisions where passenger can watch movies throughout their time in the bus. Specialises in trips from Kota Kinabalu and Semporna and back. Off Mile 6, Jln Tuaran, 88400 Kota Kinabalu. Peti Surat 35, 91308 Semporna, Sabah. CatchThatBus offers online bus tickets to many routes covered by Manis Liner as well as seat availability features. You can book your bus ticket online from our website or via mobile app which can be downloaded for free on Google Play or App Store.